HVUT otherwise Truck Tax Form 2290 is a yearly tax return filed for operating heavy motor vehicles on the highways with a taxable gross weight of 55,000 pounds or more & 5,000 miles (7,500 miles for Agriculture vehicles) through form 2290. If you own a heavy-duty truck that was brought to the road on the last month, then filing your truck tax by the end of the following month is mandatory. For example, vehicles first used in the month of October should file it before November 30 and accordingly. However, if yours is an agricultural vehicle that travels within 7,500 miles then it is considered suspended however, giving you the privilege to report and not pay. Besides, vehicles serving the government bodies (Red Cross, charity, etc.) are exempt from paying taxes, only required to report. When choosing to report taxes electronically you have the extra benefit to do amendments or corrections instantly with the IRS. You could amend your previous reported 2290 when you drove extra miles on a highway or cross taxable gross weight after a period of time. Truckers quite offer miss type the VIN# while reported with the IRS, off course 17 long character and hard to remember all time; you only notice this while taking it for renewing tags or renewing insurance plates. No need to worry as mistakenly reported VIN# can be corrected on the same day within hours through taxexcise.com. E-file a VIN correction and correct your Schedule 1 copy with the right VIN# and collect in minutes. The taxable period for filing heavy vehicle use tax is from July 1 (present year) until June 30 (subsequent year). If you’re bringing your vehicle on the highway for the first time, then taxes for the vehicle should be filed before the end of the following month. Using your vehicle on the highway after July makes you liable to file truck tax during the pro-rated tax period. Filing before the due date expires will save you from paying penalties and save some dollars too. The Heavy Vehicle Use Tax Form 2290 is due by August 31st, the due date is pushed to the next business day if it falls on a weekend and federal holidays. When highway motor vehicles used for logging (transporting forest product) purposes it qualifies as a logging vehicle, specially meant for carrying forested products from one place to another. Operators and owners of logging vehicles should file form 2290 annually and before the due date. However, the amount to be paid is less compared to what other category truck tax filers pay. Highway motor vehicles used for farming purposes are qualified as an agricultural vehicle. If you own one, you only have to report to the IRS about the miles traveled. Whereas, if the vehicle crosses the mileage limit of 7,500 miles then make sure you report it to the IRS before the deadline or you will have to face IRS audit and penalties. The last day of filing your truck tax falls on the following month when your vehicle was first put into use. You could opt to choose “Final Return” if you’re closing your business or don’t have any more taxable vehicles to report 2290’s to IRS. 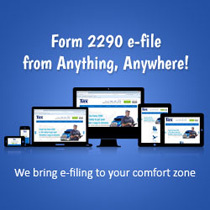 This will keep IRS informed you will not be filing form 2290 HVUT anymore. Popularly referred as EIN, is a 9 digit Federal Tax Identification number issued by the Internal Revenue Service. The employer identification number can be obtained online without spending your time, running around IRS office. This EIN number has to be used when you report truck tax or opening a bank account when you’re establishing you’re trucking business. Well, this is one subject asked by all since the time E-filing has taken its vows. As it is easy, accurate, and fast, you tend to save much time and also some dollars. The advantage here is that you could zero down all possible human errors while preparing a tax return and avoid paying additional taxes with accurate math. Take extra care while you enter your Vehicle Identification Number as your IRS water marketed Schedule 1 “Proof for Payment” with have the same VIN# you reported, either we or IRS could not validate your VIN# only you know it very well. Always use your registered business name and EIN# to report taxes; if you have missed out something that does not matched with the IRS record you return will get rejected. You can take time out to validate it and resubmit it to the IRS for processing on the same day. Always prefer to pay your tax liabilities using EFTPS or EFW as it is more convenient and simple to pay your dues on time.